The sprawling Angkor Wat temple, known for its grandeur, architectural wonder and rich heritage is not only a favourite spot of archeologists and historians but also a favourite among common tourists. Even though it is considered as the most explored places on earth, it still holds a mystical charm about it that is waiting to be discovered. Let us look at some of the intriguing specifics about Angkor Wat I have collected through my extensive search below. Earlier, historians assumed that people settled in Angkor due to the extensive availability of land suitable for agriculture and military positioning. But other researchers however, believe that the geographical position of Angkor complex and the order in which the temples were arranged indicated scientific planning based on planetary motions and positions. Computer simulations dawned on the details that the Angkor complex mirrored the position of stars of the Draco constellation to support the synchronization of the stars and the earth. It is believed as an attempt to liberate mankind from their miseries and enable them reach the abode of Gods, peacefully. The huge temple symbolizes the mythological Mount Meru while the moats and five rectangular shaped walls one inside each other represents the cosmic ocean and mountain ranges respectively. The small dimensions of the huge compound are accurately aligned alongside the north and south axis while the west and east axis has been intentionally diverted by 0.75 degrees north of west and south of east, apparently in order to provide a three day expectancy time for the observers to witness the spring equinox. Other than the temples that were built using stones, all the other buildings including houses, public places and palaces were built using wood and hence we are able to see only the remains of the temples while not able to see others which could have destroyed and decayed long back. 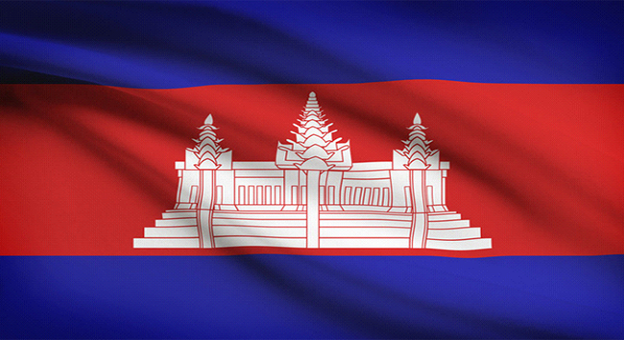 This monument is the pride of Cambodia and hence is featured on the Cambodian national flag and various Riel (currency of Cambodia) denominations. Apart from Cambodia, the only other national flag that has a national monument showcased on it is Afghanistan. Unlike other Hindu temples with their orientation towards the east, Angkor Wat is oriented towards the western direction that is usually related with death. Even the Bas-reliefs have to be read in the anti-clockwise direction. The hydraulic system of Angkor is praised by all as an outstanding mechanism that played a major role in irrigation and architecture. The Khmers were amazing engineers who managed to guard the civilization from collapsing for nearly six centuries until it was overwhelmed by a greater force unknown to many. Not many are aware that the temple surfaces were actually painted once upon a time. Now, only traces of them could be seen. Likewise, the bricks were actually bonded with each other using a vegetable compound that is almost invisible to naked eyes, instead of mortar. The lion statues found on the entrances symbolizes that this place too was considered as the home of gods because according to Hindu mythology, lions guarded the palace of lord Brahma (the god of all creations). The sculptures also showcases various everyday aspects observed in the city including the ones that feature two men seen bending and focusing on a board game, a woman delivering a baby and so on. Religious festivities were celebrated with pomp and splendor that included boar fighting and fireworks. When the kings ventured out it was a spectacle not to miss. The royal processions had horses and elephants decorated using gold while the palace women adorned with flowers. People belonging to middle income groups ate rice with the help of spoons made from coconut husks and drank wine created from rice, honey or leaves. He also mentions a ghastly practice of collecting gall from living human donors that was believed to be a tonic to boost courage. Though loads and loads of information are discussed and jotted down in this page, there is so much more than this waiting to be unleashed and discovered at Angkor Wat. Why wait? when you can go in-person and enjoy the wonders all by yourselves. I am sure the search for “Angkor Wat” will fetch thousands of page results and even more than that for it is one of the ancient monuments that has been profusely discussed, seen and read about. But there are still some intriguing specifics about Angkor Wat that has either gone unnoticed or hidden.